Because my birthday is at the end of May, I usually end up celebrating on Memorial Day weekend, as I did this year. I have been drinking coffee since I was 15, and have always loved coffee with cake. 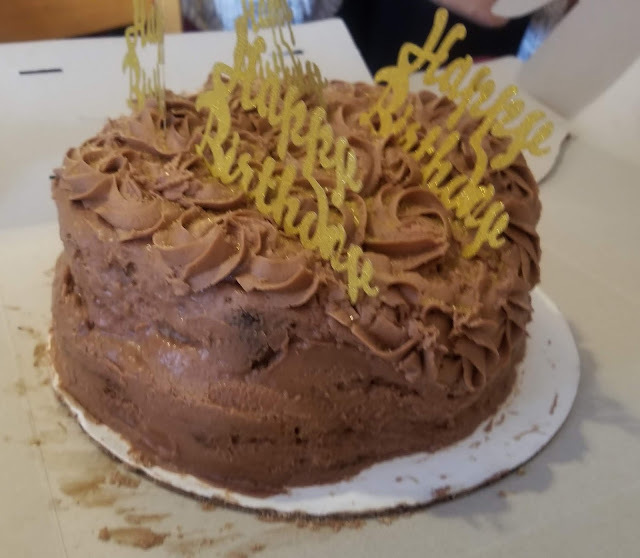 This year, my birthday cake, a vegan cake made by Asia Bullock, owner of Asia B’s Sweet Treats, was a 3-layer yellow cake with chocolate icing---à la vintage Betty Crocker. It was my dream cake. When I tasted the cake it reminded me of when the kids in The Lion, The Witch, and The Wardrobe (written by C.S. Lewis & published in 1950 as part of the Chronicles of Narnia series) first tried Turkish delight, a traditional starchy confection, made with powdered sugar and rosewater, which was rendered magical in the story. The cake was so good, so sublime, and so otherworldly that the only way to make it better (at least for me) was with coffee. 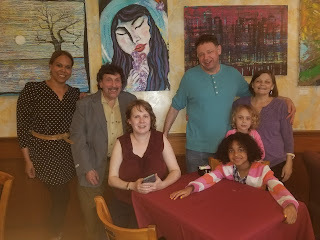 My friends and I celebrated at Trend Coffee and Tea House, which has become Montclair, NJ’s go-to coffee hot-spot, with a schedule of musicians performing live, a burgeoning sip-and- paint scene upstairs, and amazing coffee, espresso, sandwiches and soup----against the backdrop of the charming locale, a house that was built in 1860, replete with large square-pane bay windows, seating nooks, high ceilings, vintage book shelves, original art, and an airy, lofty sense of openness. It was a gray, wet, early summer day, and it was perfect. The coffee flowed, the kids played, the adults laughed a lot, and there was singing and gift-giving. Speaking of gift-giving, my favorite surprise this year was gifted to me by my very talented writer-colleague, Jess, who shares my love of coffee --- “Coffee Gives me Superpowers,” written by Ryoko Iwata, who lives in Seattle and blogs at “I heart coffee”, arrived via mail courtesy of Amazon on the day before my birthday. There have been a lot of books and articles written about every aspect of coffee, but this book approached the topic of coffee from a different angle. “Coffee Gives me Superpowers” is a compendium of coffee-related facts presented in infographic format---served up with a heaping dose of humor. Iwata covers it all---from brewing, to health benefits, to coffee culture, coffee personality types, and an overview of the language for espresso-based drinks. Did you know, for example, that people who take their coffee black are “straightforward, quiet, moody minimalists,” according to Iwata. Also, black coffee is calorie-free, ‘makes you poop,’ and is not good to drink in early pregnancy. Norway is the #1 coffee-drinking country in the world in per capita terms, Washington state is the #1 coffee-drinking state in the U.S., and Arkansas has the lowest per capita coffee consumption in the U.S. If access to caffeine suddenly disappeared, the world as we know it would cease to exist. Planes would crash, businesses would shutter, children would not be sent off to school on time, if at all, economies would falter and crumble, and people everywhere would descend into deep depression and hysterical madness. Caffeine really is a drug---and it can be deadly, but honestly in terms of coffee, it would be very difficult to overdose. On average, a cup of brewed coffee has between 95 mg and 200 mg of caffeine (compared to Red Bull, which has between 76 mg and 80 mg). A lethal dose of caffeine is between 10 and 20 grams, which translates into 5 gallons of coffee. However, not surprisingly, you can now buy pure, unadulterated, concentrated caffeine online. Earlier this month, the FDA sent warning letters to two companies that sell highly concentrated caffeine products. And what about decaf? Many coffee-lovers say ‘why bother?’ when confronted with the notion of decaf coffee, but decaf coffee has its place. However, even in its commercially decaffeinated state, coffee contains numerous antioxidants and health-giving properties. But here’s one thing, I absolutely didn’t know. Decaffeinated coffee does have some caffeine it, roughly 8.6 mg to 13.9 mg—less than 10% of the standard dose in a normal 8-ounce cup of coffee. While it doesn’t have the thermogenic, fat-burning effects associated with caffeinated coffee, decaf also decreases the risk of type 2 diabetes, liver disease, many different types of cancer, stroke, Parkinson’s disease, Alzheimer’s disease, depression, and suicide. Another ‘did-you-know’ caffeine fact: When you consume coffee, it takes 20 minutes for the effects of the caffeine to kick in, and those effects can last anywhere from 8 to 14 hours. Having celebrated another birthday, there’s one thing I’m sure of. Time marches on, new players come on stage, the drumbeat of life is constant, and the need for caffeine is daily. Caffeine truly is the gift that keeps giving. Make sure you have your daily dose of coffee—and enjoy the beginning of summer 2018!